July 10th is National Pina Colada Day, and it's a holiday I for one, would like to partake in. I feel like I've said more than once that I'm still waiting for the summer to start, yet, here we are into July. Summer has started, so what am I waiting for? There was shortcake, fireworks, picnics, pesto... this is it, and it's time I got into the summer state of mind. National Pina Colada day? Yes, please! 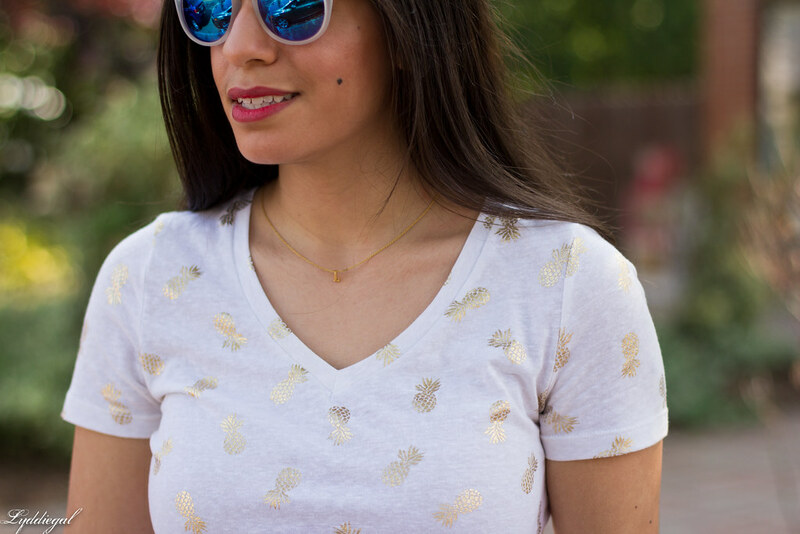 That is definitely a holiday I can get very enthusiastic about celebrating, although I realize that I somehow haven't jumped on the pineapple trend bandwagon... so I'll just have to drink some actual pina coladas ;) That said, you have me wishing for a pineapple shirt now, as you do every time you wear this top, because those little gold pineapples are just the cutest. And so sophisticated! I love how bright and just generally fun this is - it's so far away from my own personal style and I just love it. 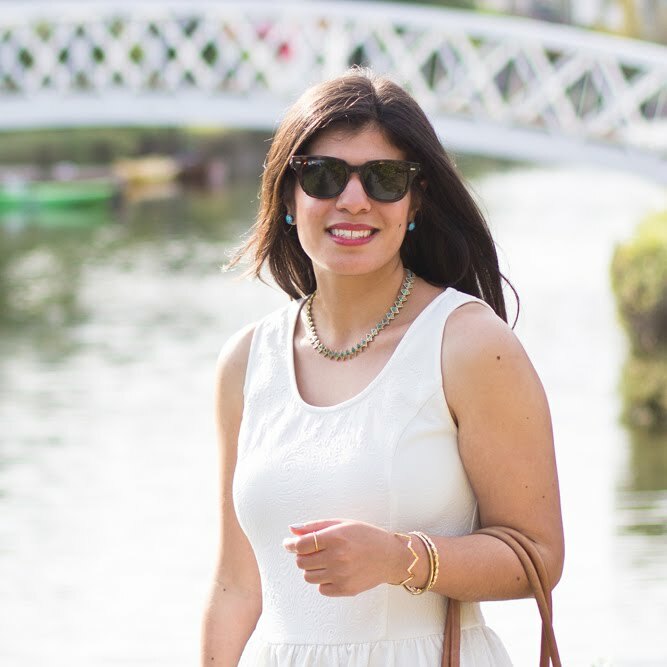 You look so cheerful and summery! 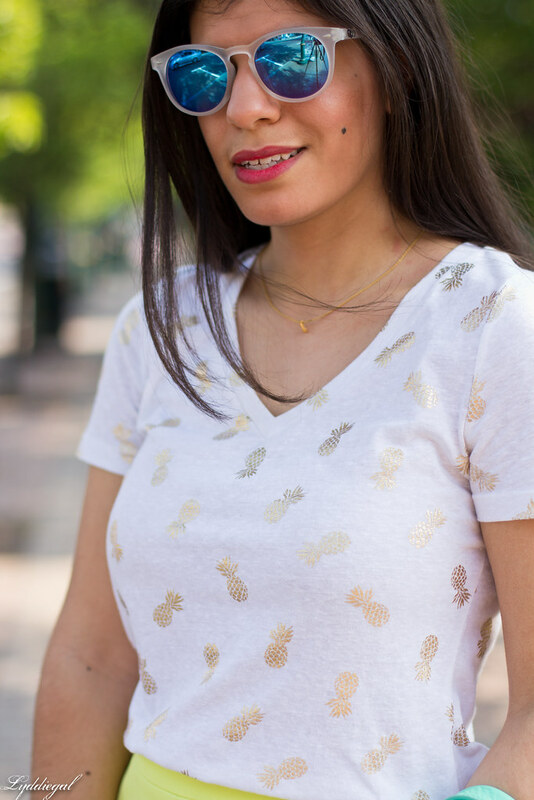 I LOVE that you are wearing a pineapple shirt for Pina Colada Day--my favorite drink! I didn't know about the holiday, but now that I know, what better excuse to have one or two?? Love this outfit! Great colors! I'm not really a Pina Colada fan (it's the coconut...just not my thing) BUT I want to wear this. All of it--that fun shirt, the skirt...summer perfection here!! That shirt couldn't be more perfect! Thanks so much for linking up! I am swooning over that adorable top! 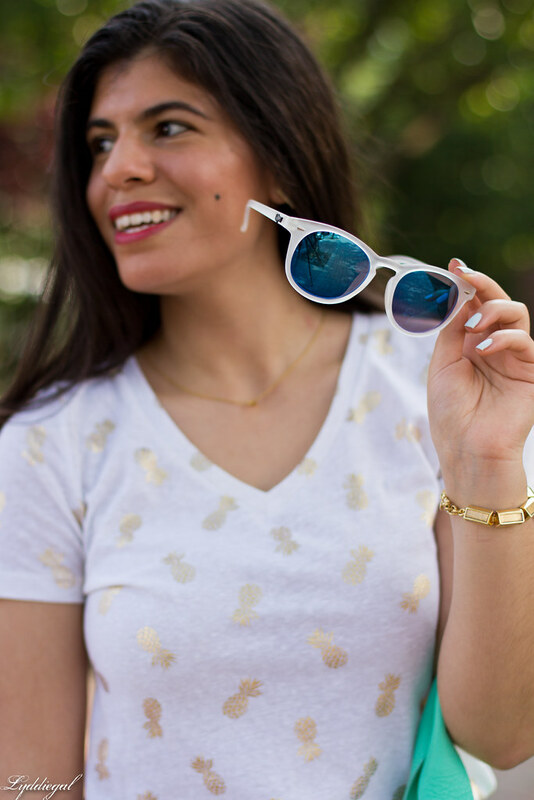 Something about pineapple print is just darling and this is no exception! I always wanted to see that skirt on! It looks great on you, love the color! Loving the pineapple and yellow combo! 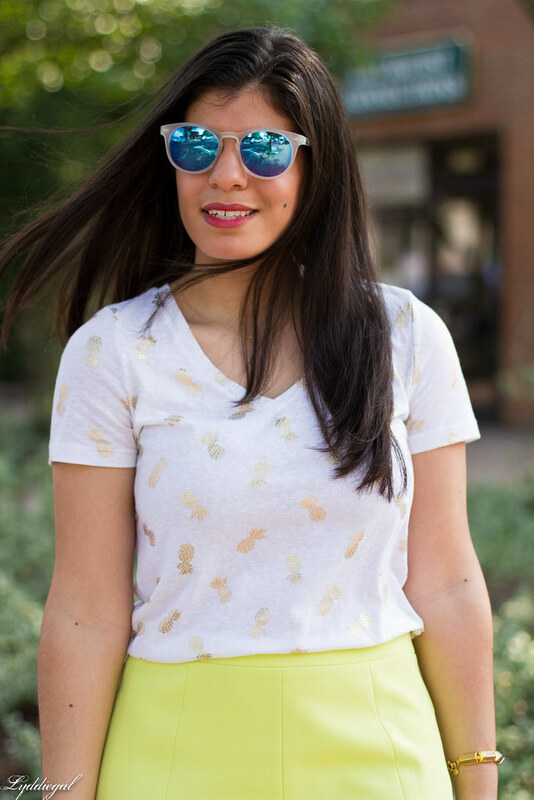 Aww summers should definitely be full of pineapple t-shirts and shortcakes with friends! 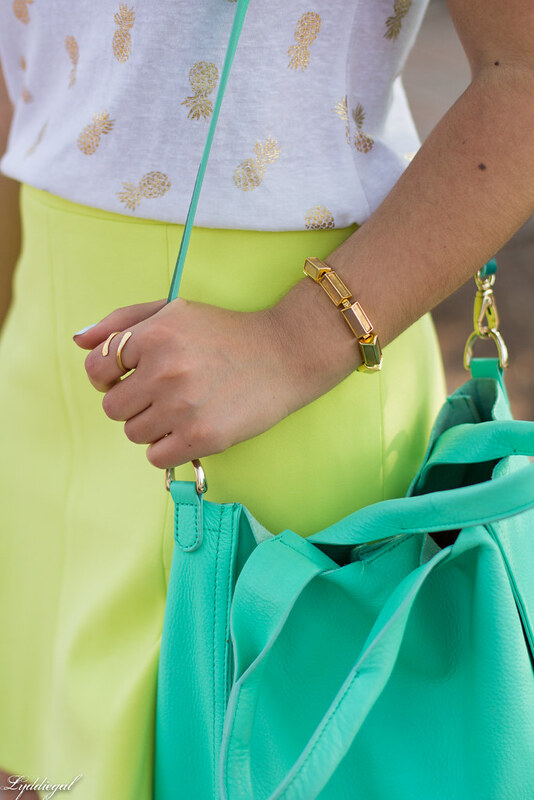 This is definitely a fun summer look - love the bright skirt and the cute pineapple print. Those sunnies are super cool too. Thanks for linking up!